AMHERST, Mass. – Homeowners concerned about the decline of bees, butterflies and other pollinating insects need look no further than their own back yards, says ecologist Susannah Lerman at the University of Massachusetts Amherst and the USDA Forest Service. In new research, she and colleagues suggest that homeowners can help support bee habitat in suburban yards, specifically their lawns, by changing lawn-mowing habits. The researchers found that taking a "lazy lawn mower" approach and mowing every two weeks rather than weekly can help encourage bee habitat in suburban lawns by allowing flowers to bloom. Longer intervals between mowing lets the lawn flowers bloom, which helps bees. She says, "Mowing less frequently is practical, economical and a timesaving alternative to replacing lawns or even planting pollinator gardens." Given the pervasiveness of lawns and other habitat loss for pollinators, the research findings provide immediate solutions for individual households to support bees in suburban settings, she adds. Lerman conducted the study with her colleagues Joan Milam at UMass Amherst, Alix Contosta at the University of New Hampshire and Christofer Bang at Arizona State University. Findings appear in the current issue of Biological Conservation. 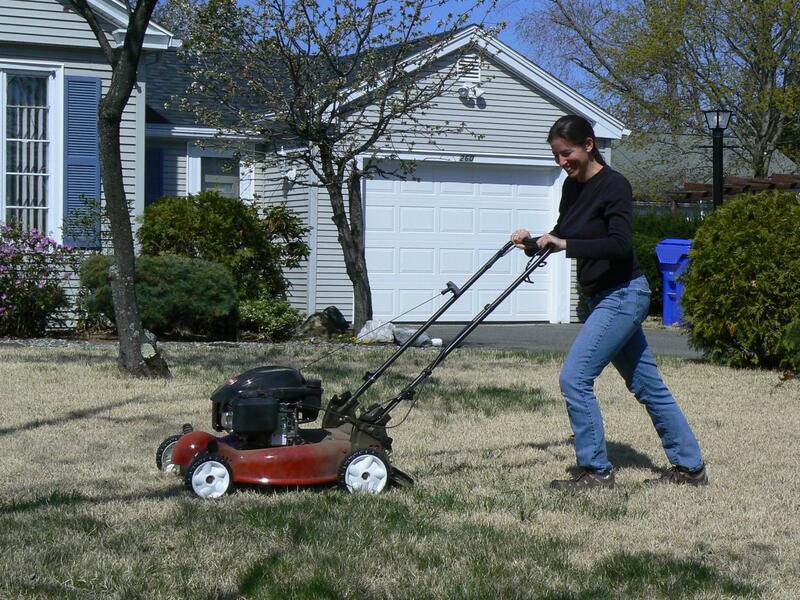 For this study, supported by the National Science Foundation's (NSF) Science, Engineering and Education for Sustainability (SEES) program, Lerman and colleagues recruited 16 homeowners in Springfield, Massachusetts, and during 2013 and 2014, assigned each yard one of three mowing schedules so that yards were mowed either every week, every two weeks, or every three weeks, and then tested how the bees responded. Before each of five bee-sampling occasions per season, the scientists counted "yard" flowers – ornamentals not affected by mowing – and "lawn flowers" such as clover and dandelions growing within the grass, for the entire property. They also measured average grass height, counted and identified bees, and calculated several metrics to understand how bees responded to changes in mowing frequency: bee abundance, richness, and evenness, all of which drive patterns in bee diversity, Lerman points out. The authors observed a total of 4,587 bees representing 93 bee species, with supplemental observations reaching 111 bee species. Lawns mowed every three weeks had as much as 2.5 times more lawn flowers than lawns mowed on the other schedules. The lawns mowed every two weeks had the greatest number of bees but the lowest diversity compared to the other two mowing intervals, they report. Lerman and colleagues point out that bees are essential for crop pollination and supporting natural ecosystems. But both domesticated and wild bee species are in decline around the world, due in part because of urbanization, agricultural intensification and loss of habitat. However, co-author Milam says there's reason to be cautiously optimistic: "I was amazed at the high level of bee diversity and abundance we documented in these lawns, and it speaks to the value of the untreated lawn to support wildlife." Further, says Contosta, "There is evidence that even though lawns are maintained to look uniform, they may support diverse plant communities and floral resources if the owners refrain from using herbicides to kill 'weeds' such as dandelions and clover." Bangs adds, "We acknowledge our small sample size and the study's limitation to suburban Massachusetts, though the findings may be applicable in all temperate areas where lawns dominate." Lerman says, "This research is a reminder that sustainability begins at home, and in this case involves doing less for more buzz." Sam Scheiner, NSF's SEES program director, says, "A decrease in pollinators, and insects in general, is a growing problem. This research shows that we all can help address this problem with a change in how we manage our lawns, and demonstrates that basic research directly contributes to societal needs."